After Tropical Storm Yagi made landfall in China, NASA's Aqua satellite saw the storm was moving inland and dropping heavy rainfall. Yagi made landfall at 11:35 p.m. local time, Sunday, Aug. 12 in Wenling County, east China's Zhejiang Province. 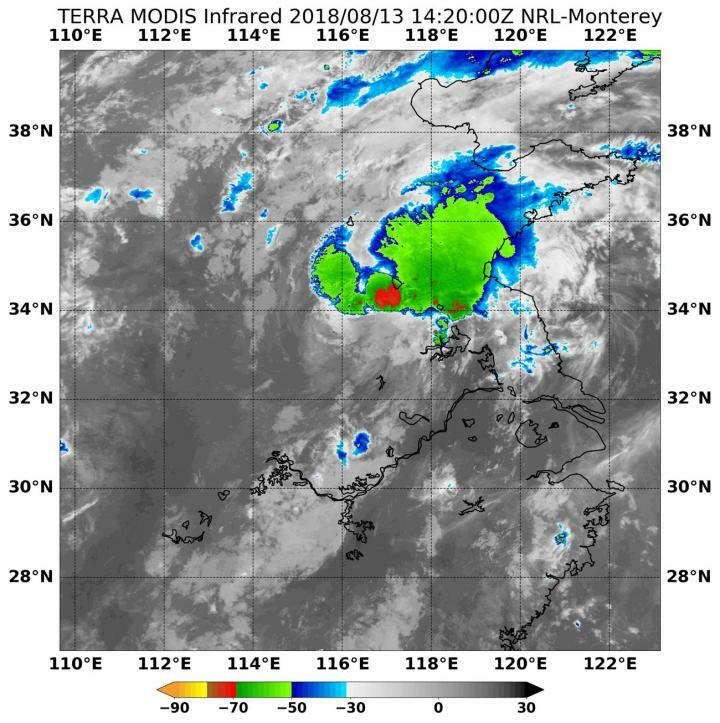 On Aug. 13 at 10:20 a.m. EDT (1420 UTC) the Moderate Resolution Imaging Spectroradiometer or MODIS instrument aboard NASA's Aqua satellite analyzed Tropical Storm Yagi's cloud top temperatures in infrared light. MODIS found cloud top temperatures of a small area of strongest thunderstorms were as cold as or colder than minus 70 degrees Fahrenheit (minus 56.6 degrees Celsius. Cloud top temperatures that cold indicate strong storms that have the capability to create heavy rain. At 11 a.m. EDT (1500 UTC) on Aug. 13, 2018 Yagi had maximum sustained winds near 40 knots (46 mph/74 kph). Yagi was located near 29.5 degrees north latitude and 119.9 degrees east longitude, about 145 nm south-southwest of Shanghai, China. Yagi has tracked northwestward at 22 knots. Yagi is forecast to continue tracking in a northwesterly direction and dissipate over China in the next couple of days.